General Hospital spoilers tease that Alexis Davis (Nancy Lee Grahn) will be stunned to see that Dr. Neil Byrne (Joe Flanigan) will appear to bring her daughter Kristina Corinthos-Davis (Lexi Ainsworth) back to her senses and have reversed the effects of Shiloh Archer’s (Coby Ryan McLaughlin) brainwashing on her! Of course, General Hospital viewers know that Dr. Byrne has experience in deprogramming, or “exiting” people out of cults, as GH viewers saw in a recent episode where he talked with Kristina’s father, Sonny Corinthos (Maurice Benard). He also was afraid to proceed because his last exit strategy didn’t work so well, but apparently, once Kristina is brought to him, he tries again with his protocol and this time it appears to work! Of course, he could have also done something similar to what Ryan Chamberlain (Jon Lindstrom) did with post-hypnotic suggestion on Lulu Falconeri (Emme Rylan) to make her think he was Franco Baldwin (Roger Howarth), and the effects only turn out to be temporary! General Hospital fans don’t quite know what to make of Dr. Byrne yet, whether he’s one of the good guys, one of the bad guys, or somewhere in between! We do know that he has experience with cults and from his conversation with Sonny, one of his recent exit strategies apparently went horribly wrong. He seemed very affected by it like perhaps it was one of his own family members or someone else he was close to. But then maybe he’s just a sensitive guy! There could be another way that Kristina’s seeming recovery could play out; she could be faking it, especially if Alexis and possibly also Sonny are in the room with her and Dr. Byrne when this therapy is taking place. She would know what her parents would want to hear, and she could say exactly that. Dr. Byrne may think he has her hypnotized but she may be fully cognizant of what is going on and she will tell everyone present what they want to hear, and therefore everyone will be stunned that the therapy has worked. Meanwhile, Kristina will flee back to Shiloh and her DOD family once she’s out of the session and will get in even deeper, possibly having the initiation ceremony redone! 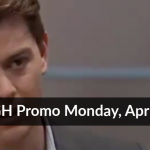 Stay tuned to GH and keep checking General Hospital spoilers frequently to see the latest news, updates, and spoilers!